CONRAD — Last spring, Conrad High School principal Ken Larson sat down to interview football coaching candidate Ryan Fetherston. Nearly an hour later, Larson asked the former University of Montana defensive end his first question. So well-prepared, in fact, that Fetherston already knew some of his prospective players when he arrived in Conrad for the interview. 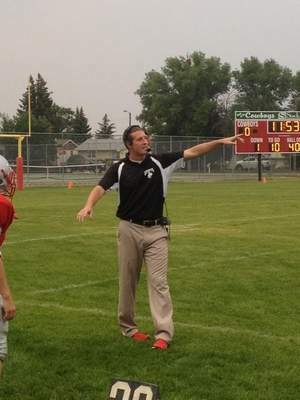 Fetherston got the job and earned his first win as the Cowboys’ head coach last Friday with a 35-0 win over visiting Harlem. Being a teacher and a coach was always what Fetherston knew he wanted to do when his career as a Grizzly player wrapped up. Now Fetherston is getting his own chance to mentor players. Larson’s son Shane, the Cowboys’ sophomore quarterback, said Fetherston’s presence has already changed the culture of the program. The Cowboys were 3-5 a season ago and have defending state champion Fairfield in their district. They continue their quest to return to the playoffs this Friday at home against Roundup.